Last weekend was the first big snow of 2008 in North Carolina. As per usual, Greensboro just saw a mere dusting, yet my childhood hometown in Avery County accumulated quite a few inches. Looking for a chance to put my new Canon 50D to work, I tossed by gear in the car and headed for the mountains and snow. I imagined I would capture white wintery landscapes, trees dripping with melting icicles, and frozen moments in nature. However, I quickly found myself drawn to the folksy shops and tourist traps along the way. These pit stops, their over abundance of hand-painted signage and rusty Coca-Cola adverts, could easily be considered an eyesore. However, those elements become somewhat signature to the area, just as any modern beach town would not be complete with out Dicks Crabhouse or Wings surf shop. On my return home, I saw a blue Chevy truck with a flat tire parked under an orange streetlamp. The colors of the streetlight contrast nicely with the cyan truck body, but also cast some interesting anglular shadows. But what makes me love this image is that it warps me between my current life, and days of the past. 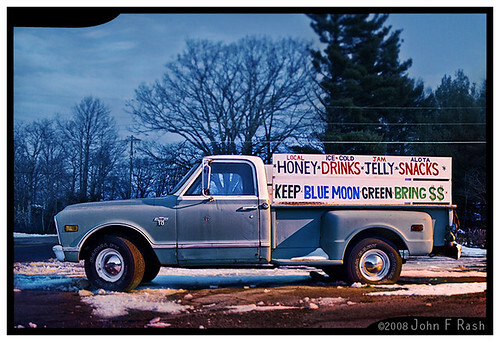 This image of the snowy truck decorated with handpainted signage evokes nostalgia for my childhood in the mountains of North Carolina. Yet, seeing a Chevy truck parked in the snow with a flat tire, broken down but maybe not down for the count, also calls to mind the current situation with the GM corporation. Someone will have to fix this truck to make it work again, and maybe that same person needs this truck to navigate the snowy landscape. Are we lost in the frozen landscape, or are we merely broken down and just need to do a bit of work to help ourselves? All images and words ©2006 Rash Photo / John F Rash.